For roof inspections, bridge or large building surveys, drones are fast becoming the sensible choice for engineers, construction and asset managers because they offer great advantages in safety and speed of access. 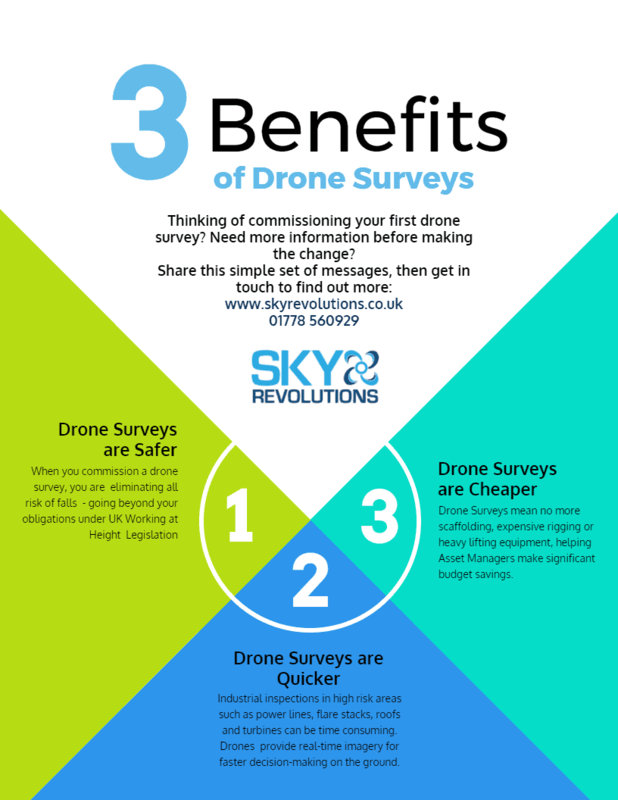 Sky Revolutions was one of the very first UK surveying companies to realise the benefits of drone surveying. We remain one of the only professional surveying organisations using AscTec Falcon 8s - the industry-leading drone used in thousands of remote inspections around the world. Why use a drone to survey? In addition to building inspections, drone surveys are now established as a valuable approach to transmission tower and powerline surveying. By eliminating manual 'at-height' working, they greatly reduce risk and improve safety outcomes. Drones can be deployed rapidly and allow asset managers to interrogate defects using ultra high-definition 4k imaging. Our drones frequently provide fresh data on previously difficult to see areas; helping our customers to make quicker, assured decisions. Our drones can capture high definition video footage which provide a view from above without the cost of hiring a plane or helicopter. Drone surveys are also more affordable, quicker and pose fewer health and safety risks than setting up scaffolding and access platforms. View our drone survey case studies. If you need to map below the tree canopy or need to see below obstructions, or you are modelling objects that require greater accuracy (representation of sharp edges on a building for example), then LiDAR is worth considering as an alternative to photogrammetry. Is a drone survey right for my industry? Whichever industry sector you're in, you're likely to find benefit in using drones to inspect and survey land, buildings and assets such as wind turbines, powerlines, telecoms towers and solar farms. For most situations, drone surveys are quicker, more cost-effective and safer than traditional manual surveys. We specialise in construction surveys for buildings and rooftops and our experts can offer advice as well as images and information to be passed on to the structural engineer for sign off. We also provide drone surveys for other commercial applications including surveying land for property development and GIS mapping for agriculture. Find out more. Our market-leading Falcon 8 Drone is powered with triple-redundant AscTec Trinity autopilot. This allows us to provide detailed images - down to millimetre accuracy - and valuable structural analysis that helps users detect and prevent further damage to infrastructure. Or visit our case studies pages for examples of our work. For more information or to book a drone survey, please contact us.